Microchip offers a small (21 mm x 31 mm) WiFi module-- the MRF24WB0MA (rolls off the tongue, eh? ), datasheet here (pdf)-- for under $24. Talking to it looks straightforward, and a few people have folded it into their projects with great results. THANKS to the fine folks at Farnell (Newark if you're in the US, like me), I find myself with one of these amazing little modules, and I'm starting to explore using it in a project or two. AsyncLabs used to sell a few products based on the MRF24WB0MA: the BlackWidow Arduino-compatible board ($75), compact YellowJacket ($55) Arduino-compatible, and the WiShield Arduino shield ($55). AsyncLabs stopped sales last March, but fortunately EAGLE-format schematics and board files are still online (eg. WiShield V1 and V2) and the library for Arduino too. Diligent sells a PmodWiFi ($60) module with a 12-pin (2x6, .1" pitch) header. 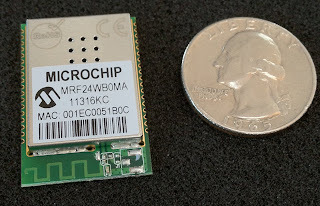 MikroElektronika has two options using MRF24WB0MA's: WiFi PROTO ($54) and EasyWiFi ($59). OpenPICUS sells the Flyport module (€49, ~$64) which includes a Microchip PIC 24F and has an IDE for programming as a standalone module. Seeed Studio sells the WiFi Bee ($70) with 2.0mm XBee header breakouts and an ATmega328 on board. Wow, that looks like a lot of hardware for very little money! Well that is great project indeed.Thanks for sharing this information with us.